AUM is the basis of all creation, it’s the very sound of the Source, by its reverberation the eternal unborn golden light becomes manifest. It’s the primeval sound equated with the big bang, the point from which all that exists was created. It’s also recognized as the true form of the higher self. We exist in a vibrating universe and in turn, everything that vibrates emits sound frequencies or patterns. In Ancient times the seekers, the adepts of introspection could perceive these subtle sounds and translated them into forms that could be reproduced by our minds and vocal cords. The Aum was special to the ancient adepts because they believed the Source which they referred to as Brahman or the Paramatma, as well as the sun, emitted the sound AUM. In the ancient language of Sanskrit, these sounds were known as mantras. A mantra is believed by its practitioners to grant health, knowledge and superhuman powers. The repetition of a mantra is done to a rhythm, usually in tune with one’s breathe to produce a trance-like effect on the conscious mind. But the main theme of the Upanishads is the reunification between the self (atma) and the higher self (paramatma). Below are quotes from the Upanishads and other ancient texts on the AUM. Chandogya Upanishad (1.4.1-5) – One should meditate on Om.… This sound is that syllable, the immortal, the fearless. Having entered this, the gods become immortal, fearless….take refuge in that syllable, in the immortal, fearless sound, and having entered it, he becomes immortal, even as the gods became immortal. Chandogya Upanishad ( 1.5.1) – Om is the yonder sun, for the sun is continually sounding Om. Chandogya Upanishad ( 2.20.1) The sun is Om. Katha Upanishad (Katha Upanishad 1.2.15-17) -That word which all the Vedas declare, which all the austerities proclaim, desiring which people practice brahmacharya, that word, to you I shall tell in brief: It is Om. This syllable is, verily, the everlasting Spirit. This syllable is indeed the highest end; knowing this very syllable, whatever anyone desires will be his. This support is the best. This support is the highest; knowing this support, one becomes great in the world of Brahma . Mandukya Upanishad (1, 8, 12) -Om: this syllable is all this.… All that is the past, the present and the future, all this is only the syllable Om. And whatever else there is beyond the threefold time, that too is only the Syllable Om.… The Self is of the nature of the Syllable Om.… Thus the Syllable Om is the very Self. He who knows it thus enters the [Supreme] Self with his [individual] Self. Mundaka Upanishad (2.2.3-6) – Taking as the bow the great weapon of the Upanishads [Om], one should place in it the arrow sharpened by meditation. Drawing it with a mind engaged in the contemplation of That [Brahman], O beloved, know that Imperishable Brahman as the target. The Syllable Om is the bow: one’s Self, indeed, is the arrow. Brahman is spoken of as the target of that. It is to be hit without making a mistake. Thus one becomes united with it [Brahman] as the arrow [becomes one with the target]. He in whom the sky, the earth, and the interspace are woven, as also the mind along with all the pranas, know him alone as the one Self. Dismiss other utterances. This [Om] is the bridge to immortality. Meditate on Om as the Self. May you be successful in crossing over to the farther shore beyond darkness. Prashna Upanishad (5:1-7) – If he meditates on the Supreme Being [Parampurusha] with the Syllable Om, he becomes one with the light, the Sun. He is led to the world of Brahman. He sees the Person that dwells in the body, who is higher than the highest life.… That the wise one attains, even by the Omkara as a support, that which is tranquil, unaging, immortal, fearless, and supreme. According to the Yoga Sutras of Patanjali The spoken form of the Source is the Pranava. From its repetition and meditation results in the disappearance of obstacles and the turning inward of consciousness. Yoga Vashishtha (5:78) – Pranayama(breathe control) is accomplished by effortlessly breathing and joining to it the repetition of the sacred Om. 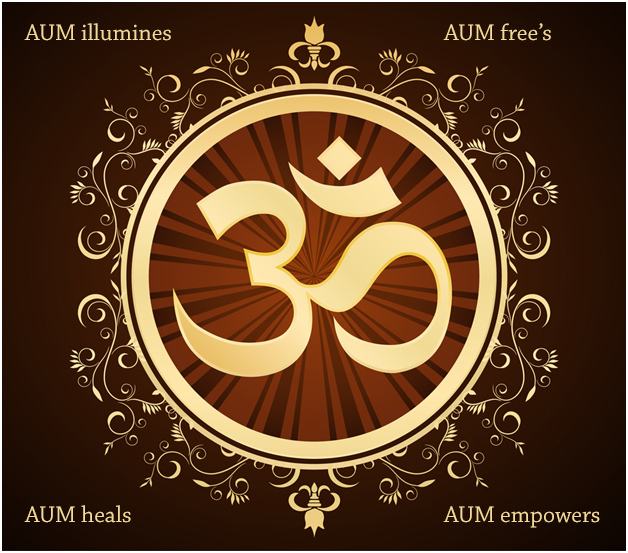 From my experience, the AUM is not only the bestower of peace of mind, but it can also heal the body and mind. Before I started this art of meditation and intoning the AUM, I cleansed myself as much as possible of all conscious & subconscious negative mental and emotional energy as laid out in my blog post ” how to unblock energy blockages to the Chakras“. Once that was accomplished I had to decide where I was going to practice this ancient art. Being that I’m aware of the importance of being grounded with the earth and to having access to pure oxygen. I decided the perfect place of practice would be at the beach facing the ocean. I chose a spot about 15 feet from the ocean on the beach, I sat cross-legged on a meditation pillow with my spine, neck, and head in total alignment. I then closed my eyelids halfway, and cast my eyes slightly downward, once comfortable and relaxed I started intoning the AUM for about 20 minutes. After the first 10 minutes, random wayward thoughts stopped, only my focus and attention on the AUM was left. What happened next was incredible, I started to feel an energy, much like electrical impulses moving up and down my back and concentrating around the head and the perineum. When I reached around the 18-minute mark, I felt swirling energy spinning around my body. The energy was so strong that it would jerk my body in its circular motion as it spun around me, I felt like I was sitting inside a mini tornado. Eventually, I started I stopped intoning AUM and began meditating on AUM. Interestingly I had the same results with the meditation of AUM as I did intoning it. My mind became, how could I say it, lighter & clearer, my intuition also improved. The more I meditated the more things did not bother me. After about a month of doing this practice, I noticed this tender pain I had in my right hip miraculously disappeared. The sounding the AUM correctly is of the utmost importance, but the posture one holds is integral to allow the energy AUM creates in the body to circulate correctly. Sit upright cross-legged or on a chair comfortably and relaxed with your spine, head and neck aligned straight perpendicular to where you are sitting. Rest your hands facing upwards on your lap one upon another, or connected in a way you feel comfortable with. Close your mouth and start breathing through your nose, being relaxed and loose. Close your eyes lids half way and align your vision slightly downwards or along the same horizontal plane as the tip of your nose. This removes visual distractions and reduces your brain-wave activity, thus helping to calm and focus the mind. Pronouncing the AUM is the key, wrong pronunciation will bear no fruit. Here I have a 20-minute youtube meditation video showing how to pronounce the AUM correctly, and also a 20 minute long AUM intoning session using a Tibetan bowl(coming soon). The AUM is not to be pronounced individually like this, AAAAA-UUUUUU-MMMM. The AUM is to be pronounced “OM” starting from the back of the mouth, then gradually the lips becoming circular, then ending it with the lips almost closed with the ‘M’ sound. While sounding the AUM you want to have gentle but focused attention on the sound. When you intone or meditate on AUM, you’re not actually creating that energy. The energy already exists it’s always existed, but what you are doing is creating a conduit to it for the energy to manifest in your reality. The goal is to sound the “AUM” in synchronicity with the outgoing breath. So breathe in with a deep breath, then breathe out sounding the AUM, and keep repeating until the mind is totally absorbed in the AUM.